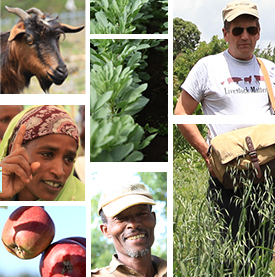 At a recent workshop discussing the design of a new research project on the sustainable intensification of crop-livestock farming systems in Ethiopia, we asked Jerry Glover from USAID’s Office of Agricultural Research and Policy to tell us more about the project. He explained that the project is intended to intensify some farming systems in Ethiopia, by increasing productivity, decreasing poverty, and increasing the nutrition and health of target populations. It is adopting an innovative approach that integrates component technologies with research on crops and livestock. It also explicitly seeks to mobilize expertise of international and national research to address the specific needs of farmers and their communities. He mentioned that the Ethiopian project is one of three in Africa (the others are in West Africa – Ghana and Mali; and East and Southern Africa: Tanzania, Zambia, Malawi).